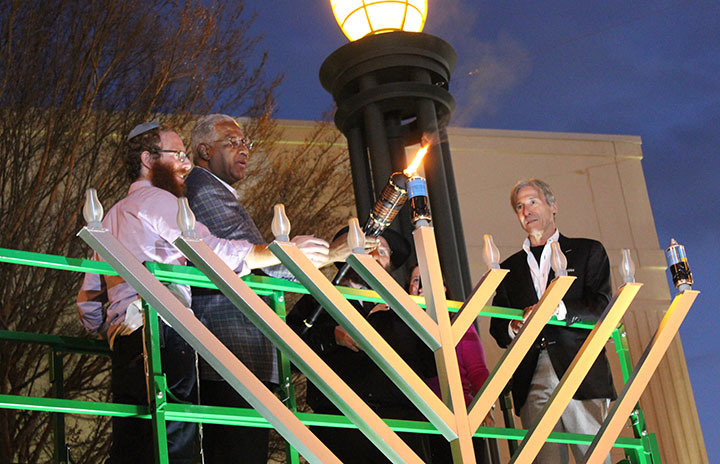 Birmingham Mayor William Bell lights the menorah at The Summit in Birmingham, December 2015. With Chanukah falling during winter break, some groups are holding Chanukah events early, while others are waiting for the actual holiday. Here is a list of events we currently have, check back for updates. Temple Beth El in Anniston will have a pre-Chanukah covered dish dinner on Dec. 23 at 6:30 p.m., with latkes provided, followed by services at 7:30 p.m. The Bais Ariel Chabad Center in Birmingham will have its Great Wall of Chinakah kosher Chinese dinner on Dec. 25 from 5 to 8 p.m. The all-you-can-eat buffet is $20 for adults, $10 for children before Dec. 20, $30 and $20 respectively after Dec. 20. There will be a menorah lighting at 6 p.m. The second annual Birmingham Grand Menorah Lighting will be Dec. 26 at The Summit’s Saks Plaza at 5 p.m. Sponsored by Chabad and the Levite Jewish Community Center, the event will include snow, fireworks, balloons, latkes, doughnuts and more. Birmingham’s Temple Emanu-El is doing its annual Feeling Gelty program, partnering with First Teachers@Home to help less fortunate families. The school readiness program gives low-income parents the tools to prepare their children, ages 3 and 4, for school success. Families that complete the course are eligible to be matched with donors for the holiday season. The shopping deadline is Dec. 9, and volunteers are needed, as well as those who want to champion a family. Emanu-El’s Chanukah Family Fun Day will be on Dec. 11 at 9:30 a.m., followed by the annual Brotherhood Chanukah Lunch at noon. There will be latkes, blintzes and salads, and a wide range of prizes. Cost is $10 for adults, $5 for children under 12. On Dec. 30, Emanu-El will have a Shabbat Chanukah service at 5:40 p.m., including a congregational menorah lighting. Each family is encouraged to bring a small platter of latkes for the reception. The Temple Beth-El Sisterhood annual Chanukah Lunch and Bake Sale will be Dec. 11 at 11:30 a.m. Pre-ordered blintzes can be picked up between 9 a.m. and 1 p.m.
Knesseth Israel in Birmingham will have its Chanukah party on Dec. 27, with latkes, dinner, schmoozing and make-your-own dreidels. Registration deadline is Dec. 18. Suggested donation is $18 for adults, and $9 for ages 5 to 12, with a family maximum of $54. Birmingham’s Levite Jewish Community Center will have its third annual “everything else is closed” pancake breakfast on Dec. 25 from 8:30 to 10:30 a.m. The menu includes pancakes, eggs, veggie sausage, fruit and cereal. Cost is $7 for adults and $4 for children in advance, or $10 and $6 at the door. Dothan’s Temple Emanu-El will take over the giftwrapping table at Wiregrass Mall on Dec. 18. Proceeds benefit the House of Ruth, which provides a safe, temporary shelter for battered women and their children. The annual Chanukah potluck dinner at Dothan’s Emanu-El will be on Dec. 30, with the Brotherhood making 250 latkes from scratch. Florence’s B’nai Israel will have its community Chanukah celebration on Dec. 30 at 7 p.m., with Rabbi Nancy Tunick. The annual Fry Fest at Temple B’nai Sholom in Huntsville, sponsored by Popeye’s, will be on Dec. 9 at 5:30 p.m. There will be Lego menorah building, face painting and singing, along with a variety of fried foods — past years have included fried Oreos and fried biscuits. The 7 p.m. service will include a volunteer appreciation. The Temple B’nai Sholom Sisterhood in Huntsville will have its annual sale on Dec. 11 from 9 a.m. to 1 p.m.
B’nai Sholom will also have a public menorah lighting on Dec. 27 at the west side of the downtown square, starting at 5:30 p.m. Everyone will go to Sam and Greggs for pizza afterward. Chabad of Huntsville will have a Grand Menorah Lighting at Bridge Street, Dec. 26 at 4 p.m., with latkes and doughnuts. Chabad will also host a Chanukah Story Hour on Dec. 14 at 4 p.m. at Barnes & Noble, Bridge Street Town Center. Etz Chayim in Huntsville will have its latke party on Dec. 18 at 11 a.m., with Bingo, latkes, a mega salad bar and dessert. Lunch will begin at noon. Cost is $7 for adults, free for ages 18 and under. Ahavas Chesed in Mobile will have its Chanukah party and dinner on Dec. 25 at 6 p.m.
Springhill Avenue Temple in Mobile will have its Chanukah family service and dinner on Dec. 16 at 6 p.m. The planned menu includes build-your-own gyros, latkes, jelly doughnuts and beverages. Dinner reservations are $10 for adults, $5 for children under 10, and are needed by Dec. 14. There will be a group menorah lighting. Chabad of Mobile will have Ladies Night Out on Dec. 21 at 6 p.m. with “Not Your Bubby’s Chanukah Cooking” with Chef Cassie. Bina Goldwasser will give instruction on Chanukah insights and kosher cooking. The “guilt-free, gourmet and glutinous” menu includes curry squash latkes, olive oil crostini with roasted beet soup, and crème brulee doughnuts. Reservations are required. The Chanukah Wonderland at Chabad of Mobile will be Dec. 27 at 6:30 p.m. There will be a five-foot ice menorah that will be lit, Chanukah gelt from Judah Maccabee, a photo booth, Chanukah boutique, crafts, a latke and doughnut bar and a raffle. At Agudath Israel-Etz Ahayem in Montgomery, Hanukkah Hoopla Latke and Hotdog Lunch will be Dec. 11 at 11 a.m. Every year since the first Hanukkah Hoopla there has been a raffle of an afghan by Mickey Feldman. Though she moved last year, the congregation’s Knitwits made one to continue the tradition. Temple Beth Or in Montgomery will have its Chanukah family service and dinner on Dec. 23 at 6 p.m. Dinner reservations are required. The Jewish Federation of Central Alabama will have a Public Space Judaism olive oil tasting on Dec. 28 at 5 p.m. at Whole Foods in Montgomery. Chabad at the University of Alabama in Tuscaloosa will have a Chanukah menorah display outside the Ferguson Student Center. On Dec. 29 at 6:30 p.m. at the Crimson Promenade there will be an event with latkes and doughnuts, open to the community. Chabad Emerald Coast will have a children’s Chanukah menorah workshop at Home Depot in Destin, Dec. 18 at 10:30 a.m. Participants will build a menorah, enjoy Chanukah treats and get a worker’s apron. Reservations are required, and all children must be accompanied by an adult. Chabad Emerald Coast's Chanukah Celebration and Grand Menorah Lighting at Harbor Walk Village in Destin on Dec. 26 at 5:30 p.m. The free family event will include doughnuts, latkes, live music and menorahs for everyone. Beth Shalom in Fort Walton Beach will have a family Chanukah night on Dec. 30 at the 6:30 p.m. service. Chuck London will tell the story of Chanukah, there will be a group menorah lighting and Latke Tots and more. The B’nai Israel religious school students in Panama City will host the congregation’s Chanukah party on Dec. 31 at 11 a.m.
Young Jewish Pensacola will have a Hockey Chanukah event on Dec. 17. The Men’s Club at B’nai Israel in Pensacola will host a Latke Party on Dec. 18 at 11 a.m.
Pensacola’s Temple Beth-El will have Chinese and a Movie on Dec. 24 at 6:30 p.m., and a Shabbat Chanukah service and dinner on Dec. 30 at 6 p.m.
Chabad of Baton Rouge starts the season with Chanukah Wonderland, Dec. 4 at BREC Recreation Center from 2 to 4 p.m. There will be a story time with PJ Library, doughnut decorating, latkes, an olive press workshop, crafts and more. The event is for ages 0 to 14 and their families. On Dec. 11, there will be a Ladies Night Out for “The Feminine Side of Chanukah” at 7 p.m. The miracle of the oil will be recounted through the art of herbal oil bottling and blending, and there will be a discussion of the role of women in the Chanukah story. On Dec. 17, the Young Jewish Professionals will have a Top Chef Live Latke Cookoff between Ryan Grizzaffi of the Cajun Spoon and Sean Rivera of Cask and Barrel and Coquilles. The 8 p.m. event includes sushi, mixologist Dante Saleos and more. The second annual Chanukah at the State Capitol will be Dec. 27 from 5 to 7 p.m., with the lighting of the 9-foot menorah, latkes, children’s activities and face painting. The Chabad activities finish with Chanukah at St. James Place on Dec. 28 at 3 p.m.
Beth Shalom Synagogue in Baton Rouge will host a Havdallukkah celebration at 4 p.m. on Dec. 24. Presented by the Sisterhood and Beth Shalom's education program Jewish Journeys, Havdallukkah will feature a dreidel tournament, puppet show, latkes, potluck dinner, havdallah and Chanukiah lighting. All are welcome to attend. Continuing a tradition over three decades old, the B’nai Israel Men’s Club in Baton Rouge will have its annual Big Buddy shopping spree for kids from low-income families on Dec. 7 at the Macy’s in the Mall of Louisiana, at 5:30 p.m. All donations are welcome, and a child can be sponsored for $125. B’nai Israel in Baton Rouge will have its Chanukah party on Dec. 23 at 6 p.m. with a Chanukah service, followed by a latke dinner and party at 7 p.m., featuring a white elephant gift exchange not to exceed $20, and a community menorah lighting. Admission is a donation to the food bank. Reserve by Dec. 19. Temple Sinai in Lake Charles will have its Chanukah service on Dec. 30 at 6 p.m.
B’nai Israel in Monroe will have its Chanukah party on Dec. 30 at 6 p.m., with the Men’s Club doing the cooking. Six13 returns to New Orleans to headline the Jewish Community Center’s 11th annual Community Chanukah Celebration in Dec. 18. The family-friendly event will start at noon with hot dogs and latkes, followed by the concert at 1 p.m.
Six13, which performed at Shir Chadash in 2009, is a six-man vocal band that brings an unprecedented style of Jewish music to the stage, with songs ranging from hip-hop dance tracks to rock anthems — all done with only their voices imitating the sound of a full band. The New York-based group has over 5 million views on YouTube, has released six albums and is included in 10 “best of” compilations. They’ve played the Chabad Telethon, Washington’s Kennedy Center, traversed New York’s Fifth Avenue in the Salute to Israel Parade, headlined the North American Jewish Choral Festival three times, and performed seven times for major league sporting events. The Chanukah Celebration is free and open to the community thanks to the support of Cathy and Morris Bart, the Jewish Endowment Foundation and the Feil Family Foundation/Lakeside Shopping Center. One of the Washington Post’s Top 10 Chanukah parties in the country returns on Dec. 15 with the annual Jewish Children’s Regional Service Latkes with a Twist. The Dec. 15 event moves this year to the Dryades Public Market in New Orleans, starting at 7 p.m. The community-wide Chanukah celebration features a complimentary latke bar by Chef David Slater of Emeril’s, live music by New Orleans’ COOT, drink specials and a silent auction. Tickets are $25 per person and can be purchased at www.jcrs.org or by calling the JCRS office at (504) 828-6334. Tickets will also be available at the event. Secure parking is available in the surface lot behind the market on S. Rampart St.
Funds raised through the event will support the PJ Library program which provides free monthly gifts of books and music to Jewish children through age 11. In addition, proceeds from the event will enable JCRS to directly assist greater numbers of vulnerable Jewish youth and families with college aid, Jewish summer camp grants, and assistance to families with children with special needs. JCRS now annually serves over 50% of all Jewish youth under age 18 in Greater New Orleans. In 2015, JCRS reached more than 1500 youth across a seven-state region. JNOLA will have its second annual Light It Up Chanukah Gala at the Audubon Aquarium of the Americas on Dec. 17 from 7 to 10 p.m. There will be hors d'oeuvres and an open wine and beer bar, and a cash liquor bar, with dancing to the Big Easy Brawlers. After the Gala, the group will head a short walk away to Lucy's Retired Surfer Bar & Restaurant for an after-party. At the event, JNOLA members will be able to sponsor a NourishPack: a kit filled with toiletries and cleaning supplies for the underserved and homeless population of New Orleans. JNOLA will be putting together these NourishPacks at Havdalah for Hope, an event being held in January. All NourishPacks made at Havdalah for Hope will be distributed directly to residents at UNITY’s Sacred Heart Apartments, which were retrofitted more than two years ago to help homeless residents, including veterans, transition into a safe and structured housing environment. Each NourishPack sponsorship is $10, and donations can be made at the gala or when purchasing gala tickets. Admission to the gala is $18, and reservations are due by Dec. 12. Beth Israel in Metairie will have a Chanukah celebration on Dec. 25 at 6 p.m., with a buffet dinner, learning, singing and a gift auction. Reservations are requested. The party is free to members, $18 suggested donation for non-members. The Sisterhood at Gates of Prayer in Metairie will hold its Chanukah Gift Bazaar on Dec. 4 from 9 a.m. to 1 p.m., along with a bake sale. Gates of Prayer in Metairie will have the Sisterhood Vodka and Latkes event on Dec. 6 from 5:30 to 7:30, to prepare for the congregational Chanukah dinner, which will be following the 6 p.m. service on Dec. 30. Shir Chadash in Metairie will have its Chanukah celebration on Dec. 24, starting with snacks at 5:45 p.m., with Havdalah, a Chanukiah contest, candlelighting and singing. Dinner follows at 6:45 with latkes and brisket; reservations are $20 for adults, $10 for ages 6 to 13 and free for under 6. Reservations are due by noon on Dec. 21. At 7:30 p.m., there will be games. Donations will be collected for Entergy’s Power to Care. Torah Academy in Metairie will have a Chanukah event on Dec. 19 at 6 .m., with latkes, doughnuts, Chanukah games, the olive press workshop and presentations, including "Elazar and Yosephus," a play from the drama elective. Admission is $5, free to Torah Academy students and their families. The Jewish Community Day School in Metairie will have its annual Chanukah program on Dec. 20 at 6 p.m., with original musical presentations and latkes. Chabad of Metairie will have a kids Home Depot Chanukah workshop, Dec. 21 at 4 p.m. at the Home Depot in Elmwood. Building projects include menorahs or rocket dreidels. Participants can receive a Home Depot worker’s apron, and there will be latkes and Chanukah treats. Reservations are required. Chabad of Louisiana and Whole Foods Uptown (Arabella Station) will host the annual pre-Chanukah kosher awareness booth on Dec. 12 from 3:30 to 8 p.m. There will be kosher information and Chanukah information and supplies. Chabad of New Orleans will have the annual Chanukah at Riverwalk, Dec. 27 from 5 to 7 p.m., at the Spanish Plaza. There will be food, music, dreidels and gelt, a latke bar, and dreidel house for children, along with a facepainter. The Krewe of Chanukah rolls for the Mobile Menorah Parade on Dec. 31, departing from Chabad Uptown at 7:30 p.m.
Touro Synagogue will have a Chanukah family dinner on Dec. 30 at 6:30 p.m., with chicken, latkes and doughnuts, following the 6 p.m. service. Reservations are $15 for adults, $10 for children. “In the Kitchen with Rabbi Silverman” at Touro will feature latkes. The program is Dec. 15 at 6 p.m., free for members and $18 for non-members, with reservations due by Dec. 12. Temple Sinai’s Chanukah on the Avenue will be on Dec. 23, with a latke Chanukah dinner sponsored by Sisterhood at 5 p.m., services at 6:15 p.m. and the menorah lighting on the avenue at 7 p.m. Dinner reservations are $16 for adults, $8 for ages 6 to 12, free for 5 and under, $12 for students. Chabad of Southern Mississippi’s annual Community Menorah Lighting will be on Dec. 29 at 6 p.m. inside the Edgewater Mall in Biloxi, near the Belk entrance. The event will include hot latkes and sufganiot, addresses from local dignitaries, kids crafts and activities, and the lighting of the largest Menorah in Mississippi. Adath Israel, Cleveland, will have its annual Chanukah service and dinner on Dec. 9 at 6:30 p.m.
Hebrew Union Congregation in Greenville will have its Chanukah luncheon on Dec. 18 at 11 a.m.
Beth Israel in Gulfport will have its annual Chanukah party and raffle on Dec. 18 at 5:30 p.m., with a dairy potluck. Beth Israel in Jackson will have its Chanukah dinner on Dec. 30 at 5 p.m., followed by services. The dinner will include brisket and latkes, and a group menorah lighting. Kosher and vegetarian options can be arranged in advance. Reservations are due by Dec. 27 and are $12 in advance and $5 for ages 3 to 10 in advance, $15 and $7 at the door, space permitting. Beth Israel will also have a Chinese dinner and movie on Dec. 25, starting at Ding How Asia Bistro at 5 p.m., then heading to the Malco Madison. A headcount is needed for the restaurant. B’nai Israel in Natchez will have Chanukah cocktails and dinner in the downstairs Fellowship Room, Dec. 10 at 6:30 p.m. The event is casual and reservations are requested by Dec. 6. The Jewish Federation of Oxford will have Latkes for Love on Dec. 4 from 3:30 to 5:30 p.m. at the Shelter on Van Buren. Proceeds from the latke plates will go to the Interfaith Compassion Ministry. The Western Shore Torah Study of Mobile’s Springhill Avenue Temple will meet on Dec. 15 at 6:30 p.m., with “The History of Chanukah.” Latkes will be served, and menorahs and candles should be brought. The study session will be at the Ennis home.